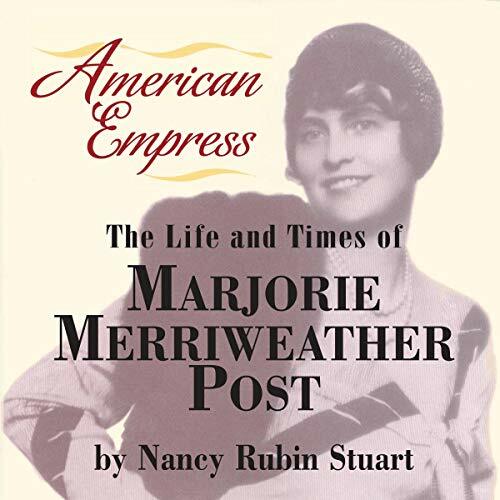 American Empress is the best-selling history of the dramatic life of heiress Marjorie Merriweather Post, daughter of breakfast-cereal magnate C.W. Post, founder of the Postum Cereal Company. As a girl growing up in the Midwest, young Marjorie Post helped glue cereal boxes in her father’s barn, later sat on the board of directors of her father’s company, wed several times, and by late middle age was widely acknowledged as the “Queen of Washington, DC” because of her friendship with presidents, senators, diplomats, and royalty. During the nearly nine decades of her life, the beautiful and vastly wealthy Mrs. Post had four husbands - among them stockbroker E.F. Hutton and Joseph Davies, ambassador to Soviet Russia under Stalin - built several glittering mansions, including Palm Beach’s legendary Mar-a-Lago, and sailed the seven seas on her huge yacht, the Sea Cloud. A glamorous and warm-hearted woman who retained her Midwestern twang and fondness for square dancing, Mrs. Post was also mother to actress Dina Merrill. Throughout her life, she gave generously to hundreds of civic and artistic causes, among them the National Symphony Orchestra, the Washington Ballet, and the Kennedy Center. Thanks to her brains, beauty, and vast wealth, Mrs. Post was a woman well ahead of her era, whose natural business acumen created the frozen foods industry and helped transform the Postum Cereal Company into the General Foods Corporation. A sweeping social history about one of America's most beautiful, wealthy, and generous heiresses, the "Duchess of Washington, DC" and the "Queen of Palm Beach", a friend to the crowned heads of Europe as well as to American presidents, first ladies, senators, and diplomats. The daughter of breakfast-cereal magnate C.W. Post, Marjorie Post's story traces her rise from her middle-class Midwestern roots to the pinnacle of America's high society. Along the way she married four times, anonymously gave thousands of dollars to widows, students, and soldiers, and earned the respect of hundreds of people for her charity, wit, and charm. About the author: Nancy Rubin (Stuart) is a best-selling author and journalist who often writes about women and social history. As a journalist, her work has appeared in The New York Times, American History Magazine, Ladies Home Journal, and other national publications. Her earlier books include The New Suburban Woman, The Mother Mirror, and Isabella of Castile, for which she won the 1992 Author of the Year Award from the American Society of Journalists and Authors. I found this book fascinating!I had no idea that companies were buying up compainies as early as they were.Marjorie lead quite a life! Lee Ann Howlett did a fine job narrating. I was given this book by the narrator,author or publisher free for an honest review.